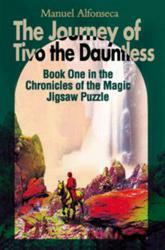 In “The Journey of Tivo the Dauntless: Book One in the Chronicles of the Magic Jigsaw Puzzle” (published by iUniverse), the first of author Manuel Alfonseca’s newly-translated adventure novels, several companions quest in the mode made famous by C.S. Lewis’ Chronicles of Narnia series. A magic object which belonged to the kings of Tiva was broken in ancient times. The seven pieces, which together make the magic jigsaw puzzle, have been lost. In this, the first book in the series, Tivo, king of Tiva, starts a perilous journey to find one of the lost pieces. The journey takes him to the other end of the continent, through perilous places and alien countries. He will meet unexpected friends and helpers, as well as dangerous enemies. Finally he will discover that the only way to win a piece of the magic jigsaw puzzle is by being ready to lose it. “Elavel reddened in anger and tried to answer the man as he deserved, but could not find the appropriate words. Suddenly, Valaz lost patience. Stepping forward, he took the girl’s arm and pushed her towards the horses.